Dress up your table for summer parties with butterflies, starfish, sand dollars, and daisies. Dress up your table for summer parties with starfish, butterflies, and daisies. 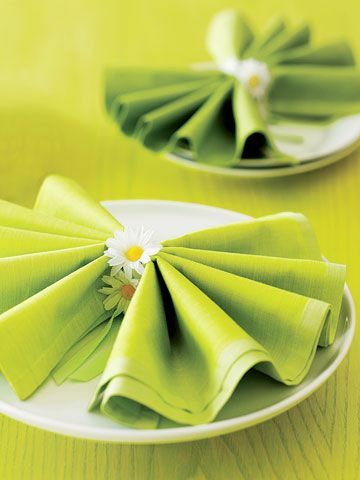 Serve up a splendid display of napkins wrapped in a ring of daisies. Here&apos;s how: Cut ribbon into 14-inch lengths. Using silk daisies, trim stems close to the flower&apos;s head. Lightly mark the halfway point on ribbon. Working from center, adhere two daisies on either side. To create fan, start from the bottom and fold napkin accordion style. Tie at the middle with daisy chain. Bring the day at the beach indoors with raffia-tied sand dollar table linens. Here&apos;s how: Roll napkin. Choose a sand dollar with four holes. With the shell facing you, weave a 24-inch piece of raffia through the top right hole and pull it across the back and through the top left hole. Lay the shell on the front of the napkin, crisscrossing the raffia in the back. Pull the ends of the raffia through their respective side&apos;s remaining holes, and knot in the back. Add a punch of color (and sugar) to the kids' get-together by tucking bright lollipops into their napkins. Here's how: Fold the napkin diagonally in half. With the straight side facing you, fold the napkin toward the point three times. Cut 22-inch-long ribbons (we chose ginghams and polka dots), tie them in a bow, and insert a sucker. Make paper napkins a conversation piece at your cocktail party by stamping them with a trio of starfish. Here's how: Choose a 1-inch stamp to allow for the most versatility — you can do a grouping, a border, or a smattering of the pattern. Press the stamp firmly onto a complementary inkpad color and then onto your napkins. Transform a plain setting with beautiful butterflies and a band of faux grass. Here's how: Roll napkin. Cut glassine paper into 7-inch lengths that are each 2 inches wide. Sporadically fray and trim the paper to make it resemble grass. 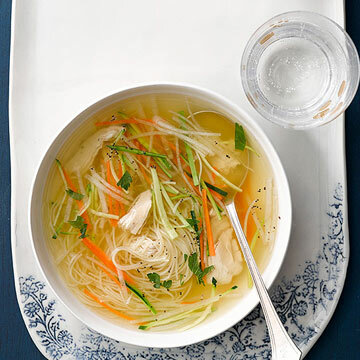 Layer pieces on top of one another, wrap around napkin, and fasten with a brad. Glue butterfly onto the center. Turn solid white into a delicious delight with green apple stamps. Here's how: Fold napkin in half. Cut the apple in half. Use the side with the stem attached as your stamp. Place a paper towel under the first layer of your napkin. Using acrylic craft paint, brush a healthy coating onto the apple. Press it onto the napkin, holding the stem down with your fingers.